The Icelandic commission has recently ruled the video of mythical 'Loch Ness' sea monster captured in 2012 to be "authentic." The peculiar video seems to show an enormous scaly creature swimming through the lake water and was shot through a window by Hjortur E. Kjerulf in February 2012, Metro.co.uk reported. The giant serpent, Lagarfljotsormurinn, has been the subject of folk tales since the fourteenth century. The footage rapidly went viral, being viewed eight million times, and the local area council set up a 'truth commission' to decide whether it was real. It narrowly voted that the video was authentic, which means that wins a prize of 2,700 pounds. 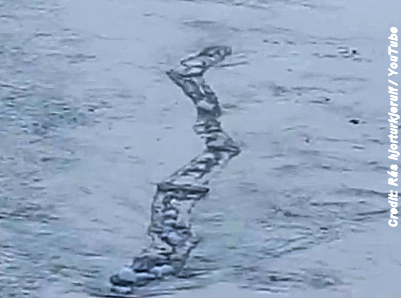 Nigel Watson, a paranormal expert, said that they are like the aquatic version of UFOs. . . .
VIDEO | Bownessie: Has Another 'Loch Ness-Like Creature' Been Discovered?